The feeding of the wire is done by two sets of feeding rollers, front and rear each driven by individual servo motor. The desired length that is to be cut can be easily set in the HMI. The straightened and cut - to - length wires are collected in the wire collector. Quickly and easily adjustable dies in the spinner. The machine has two servo motors for high speed and precision. A touch screen HMI is provided for easy working. The control is user friendly and easy to operate. Rigid construction of the machine. Working Space for Machine 3 mtrs. x 19 mtrs. 5 mtrs. x 30 mtrs. We have designed this Wire Straightening and Cutting off Machines for High Production - MWM 8S with premium quality of material that offers it a longer service life. It is designed to cut and straight lain steel wire. Our offered range is instilled with adjustable dies that provide wires of desired length. Working Space for Machine 5 mtrs. x 30 mtrs. 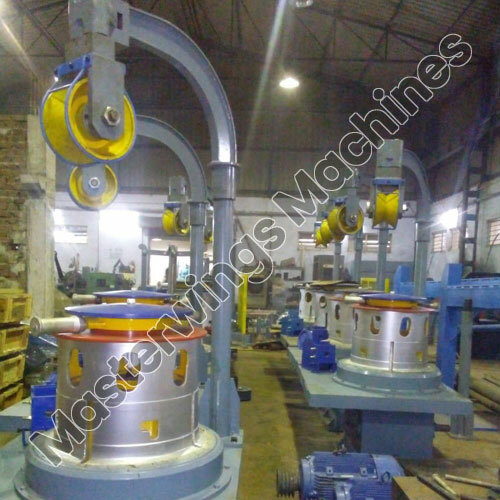 Banking on the skills of our qualified team of professionals, our company is involved in manufacturing superb quality range of MWM 6S which is integrated with two sets of feeding rollers through which wires are passed. This Wire Straightening and Cutting off Machines for High Production - MWM 6S is an excellent wire straightening machine in which the front and rear feeding rollers are run by an individual servo motor that offers them a reliable functioning. Our machine is designed using advance technologies and it is capable to cut and straighten the desired length of wire. Area per die : 25% max. Finishing speed : 360 – 400 mtrs. / min.